Lyon Hats reader, H. in Annecy, was looking for a substitute for Crisco (also known as vegetable shortening/Cookeen/Trex) to use in oatmeal cookies and pie crusts. She reports finding a good substitute at Carrefour: graisse à frire. "There are two versions - the name brand version (about 4 euros) and the generic version (about 2 euros). I got the generic. It was in the butter section of the market and is labeled "graisse a frire" - it is for frying frites in. 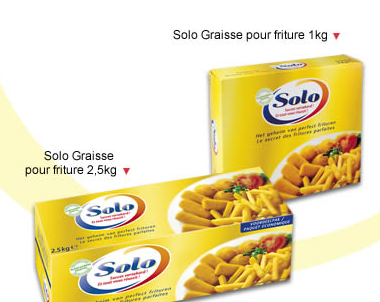 It says on the package "100% vegetale" and comes in a 1 kg package that is red and white and has photos of frites on it. It made delicious oatmeal cookies, though I had to let it come to room temperature before it was useful. I haven't tried it for pie crust yet, but judging by the cookies, I think it will work fine."